The graceful high heel of the Italian boot, Puglia is a unique part of Italy with a special look and feel all its own. There are landscapes, building styles and traditions here that exist nowhere else in the country. Licked by the sea on two sides, Puglia has the longest coastline of any Italian region and this rather adds to the slight sense you often get here of being on a Greek island and it really was part of the ancient Greek world for centuries, and tiny traces of the old language and architecture still linger. Puglia is a strikingly colourful and elemental place, full of gigantic olive trees, chalk-white cliffs, glittering turquoise water, and endearing cottages shaped like cubes or sporting conical roofs. It is a very friendly place with a strong sense of community. Plus wonderful weather, of course! Summers are long and gloriously sunny. The food and wine, meanwhile, are excellent. Sounds great, but is it expensive? Despite its growing popularity with foreign buyers over the last decade or more, Puglia remains remarkably reasonably-priced. There’s still a lot of very good-value property down here, and many different options available for restorers of old homes and also for those seeking ready-restored or new-build properties. Small country houses to restore start at around €30,000. €90,000/€100,000 might get you a simple modern house with two or three bedrooms. Seaside villas or handsome old houses inland can be had for about €250,000. Puglia also has a variety of large and stately farmhouse-mansions called masserie, which can start at around €400,000 and progress from here into the millions. You can also buy land in Puglia on which to self-build. A few acres might ask around €45,000. You should note that Puglian builders and craftsmen are especially skilled and dedicated. If you’re restoring or self-building, this is a very good region in which to do it. Puglia’s stonemasons particularly excel with beautiful vaulted ceilings which have a strong architectural tradition in the region. Only here you can live in a trullo! 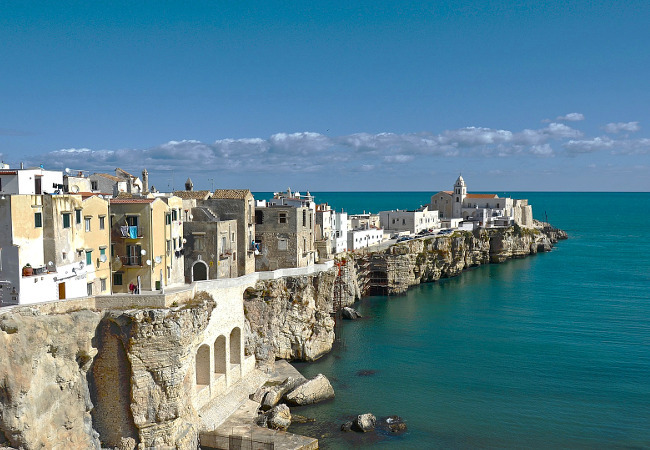 It’s useful to consider Puglia in two sections. The northwestern half has generally not yet become hugely popular with foreign buyers. The “ankle spur” of the heel, the Gargano Promontory is a delicious place with pine forests and a warm, shallow lagoon, but further inland this upper half of Puglia can be flat and a little featureless. The southeastern half of the region is the “Salento Peninsula” or Salento, and it’s where the sea embraces Puglia from two sides. This large area has been the most popular so far, yet it remains totally unspoilt and very worthy of your close attention. The coast here ranges from beaches of coarse pale sand to dramatic plunging cliffs, while inland you’re looking at exquisite countryside often rolling hills or expansive olive groves. Fascinating old towns and villages provide plenty of diversion too. A fabulous haven not only for property investors and holiday makers, but also for celebrities in search of escape. The ‘stars’ are now literally charmed by its natural sights, its unmistakable light, the whiteness of its local stones, and the unique flavour of its cuisine. That’s also why VIPs are spotted more and more frequently in Puglia. In 2012 Justin Timberlake and Jessica Biel chose this region as their dream wedding location, as did the vice president of Google, Nikesh Arora, in 2014, bringing with him Hollywood stars such as Ashton Kutcher and Mila Kunis. A few days ago a video of Madonna dancing the ‘pizzica’, the local dance style, was seen all over the world. It was in the area of Fasano to celebrate her 59th birthday. And now preparations are in full swing for the wedding of Renee Sutton, daughter of New York’s prince of real estate, Jeff Sutton, and Eliot Cohen. It will take place on Monopoli’s Santo Stefano beach on August 31st. The town also awaits the possible appearance of Ivanka Trump. And how could anyone forget Oscar-winning actress Helen Mirren, who has purchased a fortified farmhouse in the countryside of Salento area where she grows pomegranates. Would like to post a property for sale in Cassino, frosinone. Can that be done through gateway?